Caves are a real "wow, I'm waving my hand in front of my face and can't see a danged thing" kind of dark. As photography requires some sort of light energy to create an image on a film emulsion, caves epitomize the worst place to take pictures. Since the dawn of photography, people have been trying to take pictures in these dark places. In these early days, photographers used many types of lighting. These included arc light, lime light, highly actinic flash sheets, magnesium ribbon, and flash powder. The preceding types of lighting all suffered from drawbacks. Arc and lime light required great electric power sources or sources of gas. Flash sheets, magnesium metal, and flash powder, though providing a brilliant light, were capable of producing equally magnificent amounts of smoke. Not a good byproduct in caves! And, flash powder is a dangerous explosive also. However, it was the accepted method of cave (and mine) illumination from its inception in the 1860's until the first half of the 20th century. Some attempts to enclose the light and fumes of flash powder were made, but these were generally futile. In the 1880's, experiments involving igniting gasses and metals in glass globes were first conducted. John McClellan was the first to think of burning magnesium metal in a glass globe filled with oxygen, but it was never developed. Also, Thomas Bolas used burning aluminum leaf metal in oxygen to photograph a coal mine in England in 1893. In that same year, the Frenchman Chauffour designed what was perhaps the first photoflash bulb by setting magnesium in a globe of pressurized oxygen. None of these ideas led to practical developments in photographic lighting techniques until 1925. 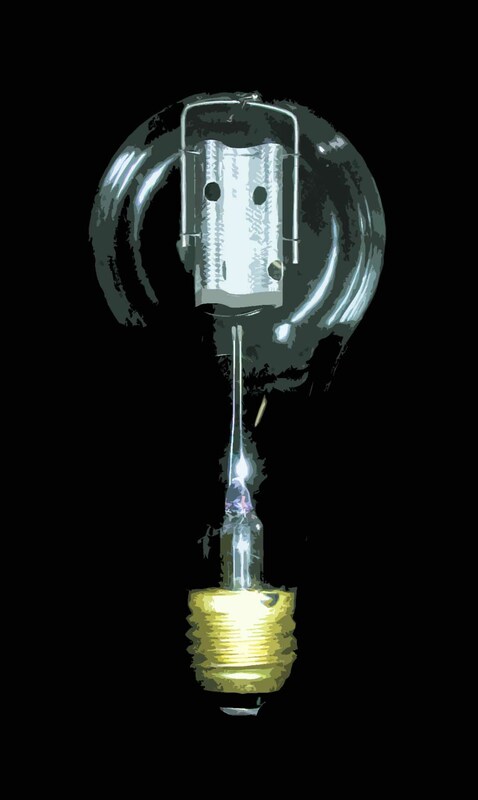 The first modern photoflash bulb (or flashbulb) was made by Austrian Paul Vierkotter, who used magnesium coated wire in an evacuated glass globe. It was later determined that aluminum foil in a low pressure oxygen atmosphere worked even better, and was cheaper to produce. Bolas' concept, first visualized some 35 years earlier, had come to fruition. On September 23, 1930, the first commercially available photoflash bulb was patented. Put into production by German Johannes Ostermeier, these bulbs were called the Vacublitz. They burned a thin tin foil. 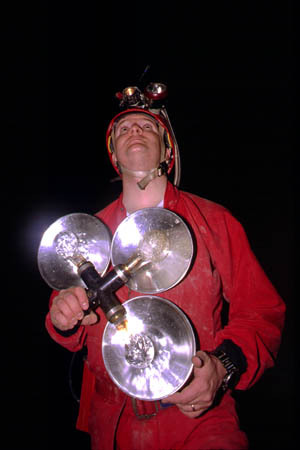 These bulbs were soon followed by the General Electric Sashalite which used aluminum foil in a pure oxygen environment. A typical 1930's era photoflash bulb was the size of a standard 100 watt light bulb. Made of clear glass, these bulbs had a typical Edison or Mazda medium screw base (though the Sashalites often had a miniature flashlight bulb base, or a bayonet base). This made it possible to fire them in standard light sockets, but this was not advisable. 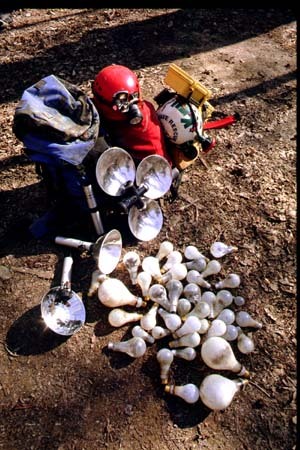 Flashbulbs have a hazard of exploding, especially if outside humid air was allowed to seep into a damaged bulb. Later bulbs (circa 1935) had placed within their spheres a tiny daub of blue cobalt chloride which would turn pink upon contact with outside air. This would alert the intend user of a possible explosion hazard. Still later safety improvements involved coating the bulb with a clear laquer to hold a shattering photoflash bulb together. What makes a flashbulb flash? Well, flashbulbs have, placed between their terminals, a piece of tungsten or zirconium filament. This wire is covered with an explosive primer paste. When current is applied, the wire heats up, igniting the paste, which then ignites the tin, aluminum or (in later years) aluminum wire (or wool). An oxygen atmosphere would increase the brilliance of the flash. Some bulbs were also filled with nitrogen gas to actually slow or delay the burn. Even though photoflash bulbs were long ago eclipsed by the electronic strobe as a more convenient form of photographic light, bulbs offer one distinct advantage. 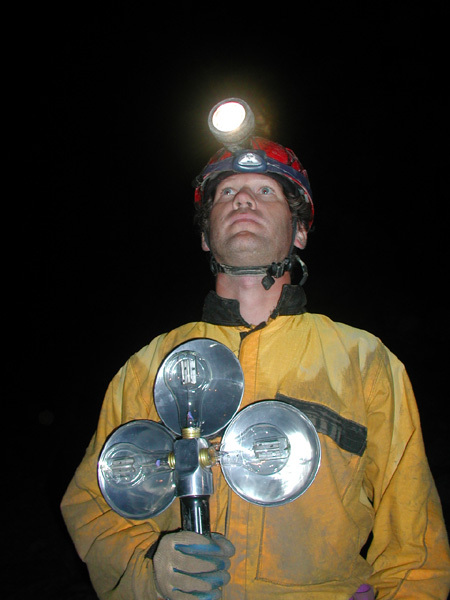 Even the smallest flashbulb can produce more light than a standard electronic strobe, and when it comes to cave photography this is important. They can have a tremendous light output (some nearly 180,000 lumen seconds), necessary for the rather slow speed of early film emulsions. The largest flashbulb, the mammoth GE Mazda Type 75, was initially developed to be used as a source of light for night time aerial photography during world war II. The Mazda 75 measured over eight inches long and had a girth of 14 inches! As the speed of films increased, the size of bulbs were scaled down a bit, although a vast array of sizes were produced. By the 1940's and 50's, many bulbs became known as "press" bulbs, and became the staple of the newspaper photographer. As photography fell in to the hands of amateurs and became a way of capturing family occasions, bulbs became very small and compact as typified by the popular AG-1, M3, GE5, and Press 25 bulbs. Also, with the advent of color film emulsions, bulbs picked up a blue coating to bring their color temperature more in line with the needs of these new films. During the late 1960's, when electronic flash first made an appearance, the use of bulbs began to decline. 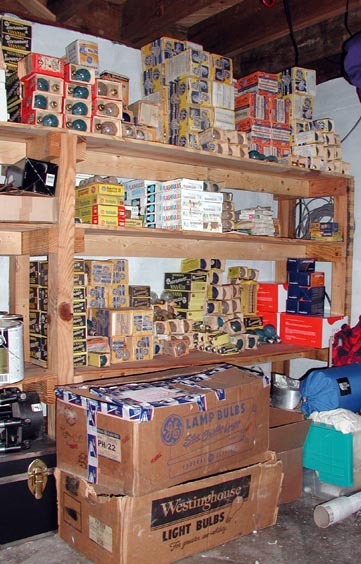 Although production of the more advanced bulbs continued until just recently, the larger screw based bulbs were relegated to the dusty stock rooms of drug stores, to antique shops and garage sales; many were simply destroyed. Today, only one company produces bulbs, Meggaflash Technologies, Ltd., of Ireland, mainly for theatrics or for special effects. Some extremely specialized bulbs, such as the Meggaflash PF330, are used primarily as a source of very bright floodlight for high speed movie photography. photoflash bulbs. 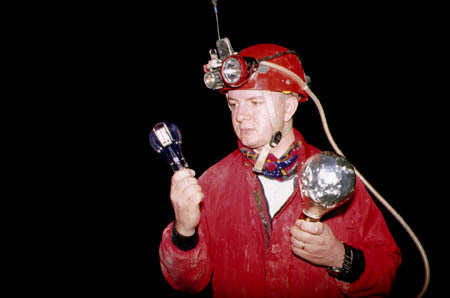 Many serious cave photographers, myself included, have taken to stockpiling bulbs. My collection contains several thousa nd bulbs, and I collect rare and unusual bulbs as a secondary hobby. The image at the top of this page illustrates a very small sample of some of my better 'finds'. Some information in this page was compiled from Chris Howes book To Photograph Darkness-The History of Underground and Flash Photography, and from articles appearing in About.com, and from personal texts.